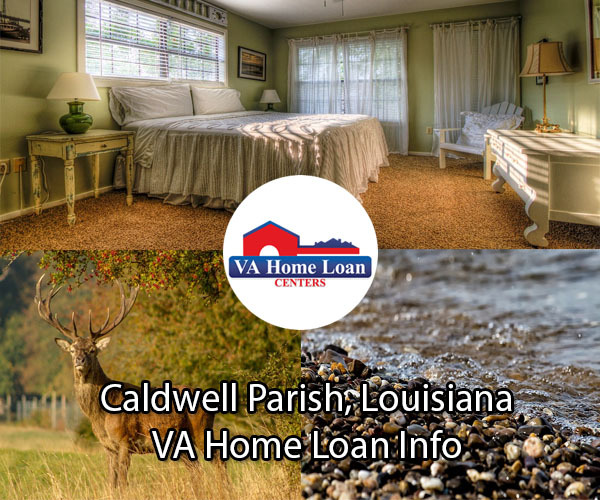 The 2019 $0 down, VA home loan limit for Caldwell Parish is $484,350. One of the lowest-populated counties in Louisiana, Caldwell Parish is the perfect place for those looking for somewhere quiet to settle down. Located in northern Louisiana, Caldwell Parish is home to some of the most beautiful outdoor areas. Be sure to attend all of the exciting events held in the parish for some great local food and music! If you are interested in history, then be sure to check out all of the interesting historical landmarks in Caldwell Parish. The parish was officially created on March 6, 1838. The current population of Caldwell Parish is 9,993, including a veteran population of 651. Bring your friends and family to all of the beautiful outdoor areas in Caldwell Parish to enjoy in all your favorite outdoor activities. The Ouachita River, one of the most beautiful rivers in Louisiana, is the perfect place to enjoy in all of your favorite aquatic activities. Visitors often enjoy rafting, boating, swimming, fishing, and more in the warm waters of the Ouachita River. The shores of the Ouachita River are great places for a nice picnic or relaxing walk. If you are interested in starting a farm or getting into the agricultural industry, farming and agriculture are huge industries in Caldwell Parish. Be sure to check out all of the interesting attractions in Caldwell Parish for some fun for people of all ages. The Nature Preserve in Caldwell County is over 100-acres, and is home to some of the best views and most interesting wildlife. Home to some of the most beautiful plants, botanical enthusiast from all over visit the Nature Preserve in Caldwell Parish. The Boeuf Wildlife Preserve is a favorite of local hunters and fishers. Be sure to come to the Louisiana Artists Museum and see some of the most interesting art created by both local artists and world-renowned artists. Come see all of the interesting historical landmarks in Caldwell County to get a true view into the early days of Louisiana. The Schepis Building is a historic building located on Main Street. The Schepis Building features rotating exhibits and more. The Breston Plantation House has been standing since 1835 and is listed on the National Register of Historic Places. Other historical structures in Caldwell Parish include the Martin House, the Oasis, First United Methodist Church, and more. The Veterans Affairs Department is just one of the many veteran resources located in and near Caldwell Parish. The median housing cost in the parish is $66,800, and the median household income is $36,792. 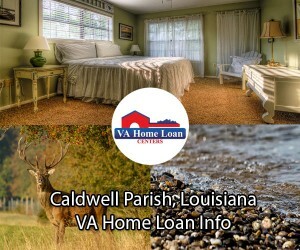 Contact VA Home Loan Centers for help finding the perfect home or condo in Caldwell Parish. Easily apply for a VA loan with VA Home Loan Centers today! There are not currently any VA-approved condos available in Caldwell County. For help obtaining condo approval on almost any condo, click here.